Dharma Productions' Kalank has a lot of expectations riding at the box office. The movie stars Varun Dhawan, Alia Bhatt, Aditya Roy Kapur, Madhuri Dixit, Sonakshi Sinha, and Sanjay Dutt in major roles. 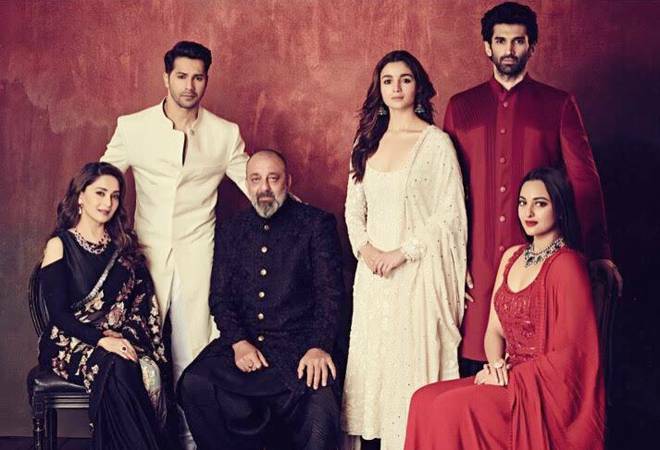 Movie experts believe that period drama Kalank, with its grand sets and big Bollywood names, is expected to gross north of Rs 18 crore at the ticket window on the first day of release. Kalank, made on a budget of around Rs 80 crore, is one of the biggest releases this year. The film is expected to match the performance of other big hits which include Total Dhamaal, Uri: The Surgical Strike, Gully Boy and Kesari. Kalank has been released in around 5,300 screens worldwide, which include 4,000 screens in India and 1,300 screens overseas. The movie is expected to gain from the release on Mahaveer Jayanti which is a holiday. The upcoming holiday, Good Friday, is also likely to boost its collections at the box office. The film has garnered mixed reviews from film critics. Trade pundit Taran Adarsh, in his one word review, declared Kalank 'Disappointing' and tweeted that "(The movie) doesn't live up to the expectations". Another trade expert Girish Johar said, "Kalank is coming from one of the topmost production houses, Dharma, which is the pioneer of making mega-budget movies. Releasing in the middle of the week, it is cashing in on the holiday of Mahavir Jayanti." "The makers are looking at a mammoth release and are eyeing maximum numbers before Avengers: Endgame release on April 26. Having a long weekend, I expect a good start as it looks big. People will at least watch it once. It will be the first preference of moviegoers also because there are no other options," he added. Kalank, with a runtime of 2 hours 48 minutes, is co-produced by Nadiadwala Grandson Entertainment and Fox Star Studios. The movie also marks the fourth collaboration between Alia Bhatt and Varun Dhawan after Humpty Sharma Ki Dulhania, Student of the Year, and Badrinath Ki Dulhania.